Congratulations to Courtney Wallace crowned Ms. Wheelchair Maryland 2012 in Rockville on November 5, 2011. Courtney is 29 years old; she has a 9 year old daughter, and her hobbies are reading, writing, enjoying nature and all things girly. Courtney works as a Life Coach and is the CEO of InsideOut Entertainment. She describes herself as random, encouraging, colorful, grandmotherly and revolutionary. Courtney will compete in Ms. Wheelchair America in Providence, Rhode Island in August 2012. Congratulations to the Ms. 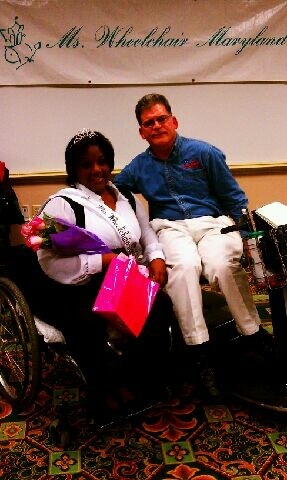 Wheelchair MD 2012 Courtney Wallace. We know you will do you very best in representing the 24.1 million individuals with disabilities in America (NO PRESSURE!). We are excited to have you as part of the Ms. Wheelchair MD organization. If you ever need any assistance in your journey, please do not hesitate to call me. Best wishes for your success as Ms. Wheelchair MD 2012! Once again, congratulations.